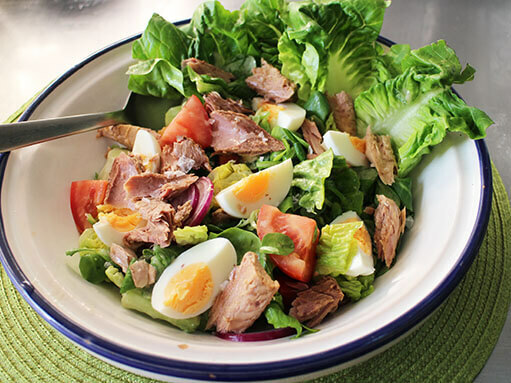 I usually find it hard to get excited about salads, but this tuna salad is actually delicious. Place the eggs in a small saucepan and add enough cold water to cover them. Bring the water to the boil. When boiling, remove from heat, place a lid on the pan, and leave for 10 minutes. After 10 minutes, place the eggs in a bowl of cold water. As soon as the eggs are cool enough to handle, peel them. Thoroughly rinse the lettuce under cold water, and dry with a salad spinner. Discard any damaged outer leaves, and cut the lettuce into bite-sized chunks. Peel the onion and slice as thinly as you can. Cut the tomato into 4 or 8 pieces. Slice the anchovies into small bits. Throw the lettuce into a large shallow bowl, and add the onions, tomato, capers, anchovies and any other vegetables you are using. Pour over the vinaigrette and work it into the salad with your hands. My recipe for vinaigrette is here. The video above is from the Keef Cooks YouTube channel. Click here to see the video recipe of Tuna Salad on YouTube. You can use whatever kinds of lettuce you like, and you could also add olives or celery.